We have some popular hiking trails in the area. 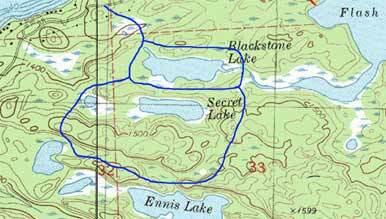 Blackstone – Secret Portage Trails on the Moose Lake Road. This is a federal hiking trail with a parking lot located on the Moose Lake road. It is moderate in difficulty for the first part which would be around Blackstone Lake. If you decide to head to Ennis Lake, the terrain will become more difficult. You will see a pond down on your left side and then one on your right side and eventually make it to Ennis at a 120 foot high cliff. It’s a nice trail and signed all the way. Time around Blackstone only is about 45 minutes. Doing the whole loop to Ennis, will be about 2 to 2.5 hours total. It’s a nice place to pack a picnic lunch and spend the afternoon. Parts of the trail will head through “blowdown areas” from the big blowdown storm of 1999. Many of our guests really like this hike. One other part of this trails system is the portage to Flash Lake. Technically, a portage is a trail, but it sounds cooler. It’s 250 rods long and a rod is 16.5 feet in length. 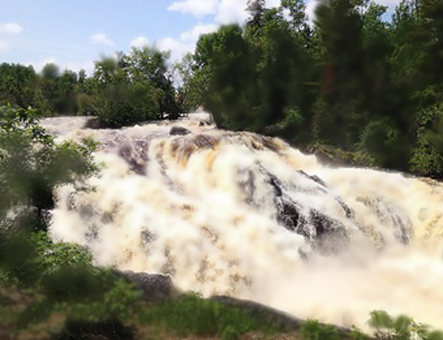 So, you can walk about the Secret-Blackstone Trail and also take the portage to Flash Lake. You can literally wander around in the woods for hours. If you leave the trail, you could wander for days which is less fun than it sounds. Stay on the trail and you’ll be fine. This is a newer hiking trail to a large whitewater rapids. It is about 45 minutes long. From Northwind Lodge, to find it, head back toward Ely about 9.5 miles. It will be just past the Fall Lake Recreation Area turn-off and before the Garden Lake Bridge on your right or the north side of the Fernberg. There is a parking lot there as well. This site is organized, very easy to navigate, stunning in color and loaded with insightful tips only a seasoned outdoorsman and resorter native to the area could give. I always enjoy reading your online content because you have an extraordinary gift for guiding guests and consumers in truthful and amusing ways. Thank you for your clear writing and throughout coverage. See you in September!